Andy Murray will head to Wimbledon confident he can win his first Grand Slam title after beating Jo-Wilfried Tsonga to win the Aegon Championships at Queen's Club. The British number one beat Frenchman Tsonga 3-6 7-6 (7-2) 6-4 to claim his second Queen's Club title and 17th on the ATP World Tour. And after reaching his first French Open semi-final earlier this month, Murray is confident he can improve on two Wimbledon semi-final appearances when play begins at the All England Club on 20 June. 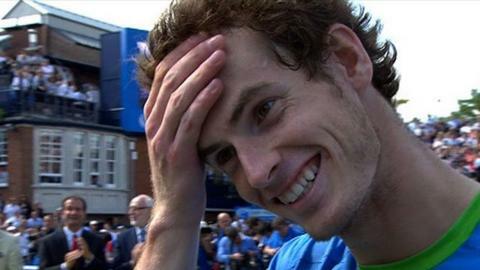 "I'm going to Wimbledon with the feeling that I'm going to win the tournament," said Murray. "I don't think you can go in with any other attitude. "I feel like I'm playing good tennis. I'll need to improve the next week or so and work on some things going into Wimbledon, but I need to play my best tennis throughout the tournament. "I'll be switched on for the first match. I'm really looking forward to the next five or six days to get ready for it, because for me it's one of the most important tournaments of the year, if not the most." Murray's victory on Monday made him the first British man since Francis Gordon Lowe in 1914 to win a second Queen's title, but the Scot said: "I don't think about that stuff too much, but you realise it is that long, it's a nice thing to be able to do and say that you've done it." One of the highlights of Monday's final was an impromptu between-the-legs shot from the Scot as he closed in on victory in the final set. "You don't get a chance to do that very often," he said. "It just came off. Sometimes it's just a reaction. I was up 40-0 in the game, probably wouldn't have gone for it if it was 30-30. But I felt comfortable on the court once I got ahead in the match. "It was nice letting something off, hitting that shot, because I had been behind for 90% of the match." And Murray described as "amazing" the queue that began forming at 0200 BST, with people trying to get tickets following Sunday's washout, and the Centre Court was a sell-out for the 12.30pm start. "You never know how busy it's going to be when something like that happens," said Murray. "Because the decision to call it off was late [on Sunday], you don't know how many people are going to hear about it. It was packed - I think it's great." Asked about Murray's trick shot in the penultimate game, a smiling Tsonga admitted that after his initial anger at losing the point he had said "good play", adding: "It's good to watch on the screen when you've lost." The Frenchman served superbly throughout the first two sets but felt it had been imperative to keep the Murray return game at bay. "During the game he can read the serve," said Tsonga, "Even if you hit the ball really hard he will put the ball in." And Tsonga, the world number 19, will head to Wimbledon optimistic of at least matching last year's run to the quarter-finals, where he fell to Murray in four sets. "I was disappointed that I lost today, not because I lost against Andy, but because I lost a final," said Tsonga. "It's difficult when you have this run in the tournament and just the last step you miss, but I feel good. I hope I will play well in the future."